The burden of atherosclerotic cardiovascular disease (ASCVD) in India is alarmingly high and is a cause of concern. Indians are not only at high risk of developing ASCVD but also get the disease at an early age, have a more severe form of the disease, and have poorer outcomes compared with Western populations. Access to health care is also not optimal in India, and the treatment of ASCVD remains expensive. For all these reasons, prevention of ASCVD should take priority, not only from the perspective of governmental agencies and health care providers but also from the perspective of all Indians. There are many modifiable risk factors for ASCVD. Of these, dyslipidemia has the highest population attributable risk for myocardial infarction (MI),  both because of its high prevalence and because of its direct pathogenic association with atherosclerosis. Accordingly, effective management of dyslipidemia remains one of the most important healthcare targets for prevention of ASCVD. LAI initiated the process of developing this consensus document during the early part of 2014. Leading experts from various specialties including Internal Medicine, Cardiology, Endocrinology, Nephrology, Neurology, Pharmacology, and Vascular Surgery were invited to participate in this process. A series of regional meetings were held with these experts in different parts of the country. The first meeting was held in Delhi on April 12, 2014, and subsequent meetings were held at Bengaluru (April 2014), Delhi (April 2014 and July 2015), Mumbai (May 2015), Kolkata (May 2015), Chennai (June 2015), and finally at Lucknow (Aug 2015). In all, there were eight meetings with 153 experts from 18 states and thirty cities of India. Each of these meetings followed a standard format. First, the key issues related to lipid management in Indians were presented to the entire group in the form of lectures, which were then followed by extensive discussion among experts on these topics. At the end of the discussion, a questionnaire covering all relevant topics was administered to all the participating experts to collect their responses about each specific aspect of lipid management in Indians. The proceedings of these meetings were video recorded for future reference. Apart from these meetings, a questionnaire was also sent to experts who could not attend the meetings. To make all the efforts to ensure practical applicability of the recommendations to the Indian population. However, while every effort has been made to ensure that the recommendations presented in this document are based on the most update scientific evidence, it is important to remember that "Medicine is a constantly evolving field, and we often have to deal with moving targets. The recommendations made in the consensus statement are not a mandate to the medical community. Keeping patient's well-being uppermost in mind, clinicians should use their judgment and experience in applying these recommendations to their patients." Among various lipid markers, the ratio of apolipoprotein B to apolipoprotein A-I appears to be the best indicator of ASCVD risk. 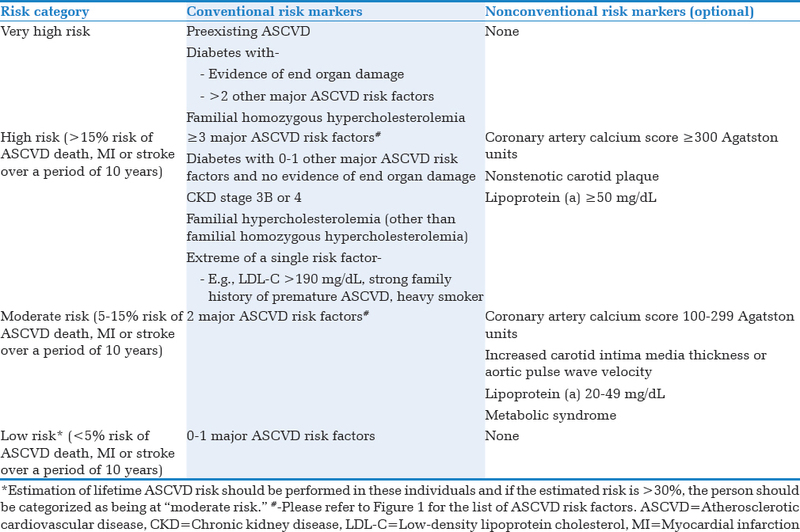 The recommended approach to ASCVD risk assessment in Indians is outlined in [Figure 1] and the different ASCVD risk categories are summarized in [Table 1]. Lifetime ASCVD risk should be estimated in all individuals who are considered to have low 10-year ASCVD risk. If the absolute lifetime risk is 30-44%, it is considered moderately high, and if it is >45%, it is considered high. The individuals who have moderately high or high lifetime ASCVD risk should be treated on par with those who have moderate 10-year ASCVD risk. 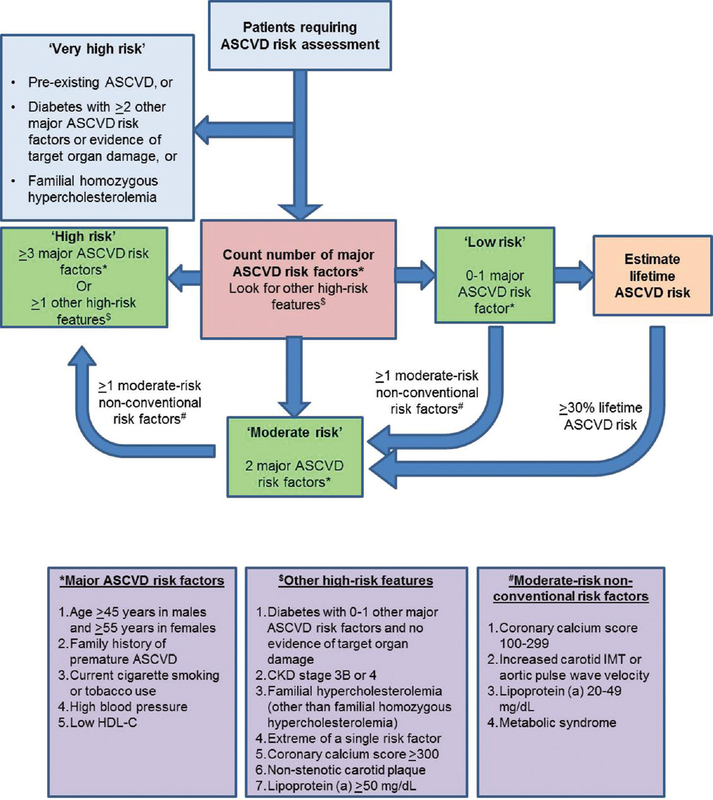 A number of different risk algorithms are available for estimation of lifetime ASCVD risk. These include the Joint British Societies' 3 rd Iteration (JBS3) risk calculator (which is based on QRISK lifetime risk model, http://www.qrisk.org/lifetime/), the recently proposed American College of Cardiology/American Heart Association Pooled Cohort Equations,  and the Lloyd-Jones/Framingham risk algorithm. Although none of these has been validated in Indians, JBS3 risk calculator appears to be the most suitable and should be preferred for this purpose. The risk calculator can be accessed at www.jbs3risk.com. Obesity and metabolic syndrome are associated with significantly increased risk of diabetes in the short-term and increased risk of ASCVD in the long-term. The approach to integration of these nonconventional risk factors in the overall ASCVD risk stratification is discussed in the preceding section on "ASCVD risk stratification." [Table 2] outlines the recommended treatment goals and thresholds for initiation of statin therapy in various risk categories. It should be noted that therapeutic lifestyle change is recommended in all individuals who have LDL-C or non-HDL-C values above the desired goals, and preferably in everyone regardless of their cholesterol levels. 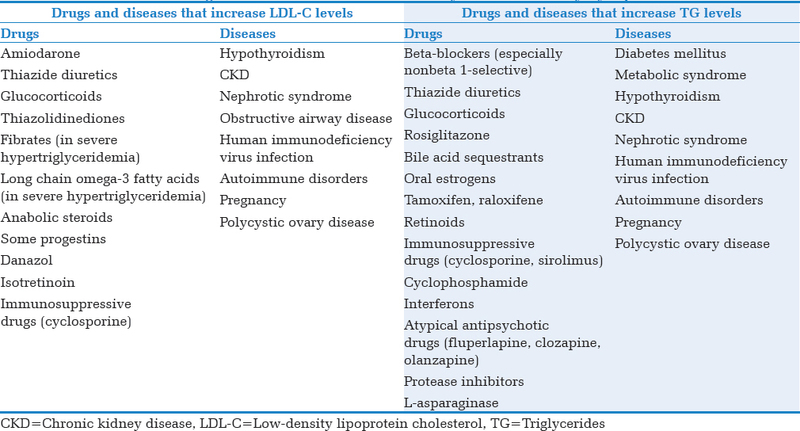 Low-density lipoprotein cholesterol as the therapeutic target: Is lower the better? The available evidence also shows that LDL-C level <50 mg/dL is safe. Nonhigh-density lipoprotein cholesterol: Should it be the primary target for lipid-lowering therapy? Increasing the dosage of statin or switching to a more potent statin and intensifying lifestyle measures should be the first step to achieve further non-HDL-C lowering when LDL-C target has already been reached. Correction of secondary causes of hypertriglyceridemia and adding a nonstatin drug such as ezetimibe, fibrate, etc., should be considered when above measures prove inadequate. Drugs such as steroids, beta-blockers, protease inhibitors for treatment of human immune deficiency virus infections. In diabetic subjects, saroglitazar, which is a dual peroxisome proliferator-activated receptor-α/g agonist, is another option. It has been approved by the Drug Controller General of India for the treatment of diabetic dyslipidemia, not corrected with statin therapy alone. However, large-scale CV outcomes studies are needed to clearly establish the role of saroglitazar in the management of dyslipidemia. Among pharmacological agents, statins remain mainstay in the treatment of low HDL-C also. Although several other agents have been tried specifically for raising HDL-C, none of them has been shown to result in clinical benefit. Fasting plasma glucose level: <100 mg/dL. Stains are safe and effective in both primary and secondary prevention of ASCVD. Their use for primary prevention of ASCVD should be guided by the estimated ASCVD risk in a given individual. Adults should also do muscle-strengthening activities that are moderate- or high-intensity and involve all major muscle groups on 2 or more days a week. However, time spent in muscle-strengthening activities does not count toward the aerobic activity guidelines. Dietary patterns are more significant rather than individual dietary components. Thus, we recommend the adoption of a dietary pattern that emphasizes intake of vegetables, fruits, and whole grains, low-fat dairy products, poultry, fish, legumes, nontropical vegetable oils, nuts, etc. This above can be achieved by adopting a diet pattern such as Mediterranean or Indo-Mediterranean diet. However, for patients who drink, alcohol should not exceed 1 drink per day for women or up to 2 drinks per day for men (1 drink = 12 oz beer, 5 oz wine, or 1.5 oz distilled spirits). Complete abstinence from tobacco products is recommended. Avoid passive smoking as well. Although no clear, large-scale studies are available with different forms of practice, we recommend that all Indians should be encouraged to incorporate yogasana and meditation in daily life. Of all the lipid-lowering drugs currently available, statins are the drugs of choice because of because of their profound ability to reduced ASCVD risk in wide variety of patient populations. ,,,,,,,,,, The net effect of statins on lipid profile is roughly 25-55% reduction in LDL-C, 15-51% reduction in non-HDL-C, 7-30% reduction in TG, and approximately 5-15% increase in HDL-C. Apart from these lipid-modifying actions, statins also have numerous pleiotropic effects that help minimize risk of vascular events. · At least moderate- or high-intensity statin therapy is required to bring about a clinically meaningful reduction in LDL-C in most patients. When patients present with symptoms, check serum creatine kinase level and rule out drug-drug interactions, Vitamin D deficiency, hypothyroidism, and other potential causes of statin-induced myopathy. Treatment options include using statin treatment in lower doses, reduced frequency or use of alternative statins. In patients with nonalcoholic fatty liver disease (NAFLD)/nonalcoholic steatohepatitis (NASH), statin treatment is safe and substantially reduces ASCVD risk by a greater margin than in those with normal liver function. In fact, statins may even contribute to the resolution of NAFLD/NASH. Aggressive lifestyle management is very important in preventing development of diabetes in patients receiving statin therapy. If a patient presents with symptoms suggestive of cognitive impairment or peripheral neuropathy and no alternate etiology is found, statins may have to be withdrawn temporarily. Statin therapy had no effect on the incidence of, or mortality from, any type of cancer (or the aggregate of all cancers). • With severe symptoms, stop the statin. • Alternatively, use statin with ezetimibe or bile acid sequestrants. 5. Encourage therapeutic life change to all. Fibrates are the most commonly used nonstatin lipid-lowering agents. Ezetimibe, omega-3 fatty acids, and bile acid sequestrants are other options. Saroglitazar is another new molecule, being used as an add-on to statin therapy for management of diabetic dyslipidemia. Alirocumab and evolocumab are monoclonal antibodies against the enzyme proprotein convertase subtilisin/kexin type 9 and result in profound LDL-C reduction. They are currently approved for the use in patients with heterozygous familial hypercholesterolemia and also in nonfamilial dyslipidemia when LDL-C goal is not achieved with statin alone or if the patient is intolerant to statin. Iyengar SS, Puri R, Narasingan SN, Wangnoo SK, Mohan V, Mohan JC, et al. Lipid association of India expert consensus statement on management of dyslipidemia in Indians 2016: Part 1. J Assoc Physicians India 2016;64:S7-52. Goff DC Jr., Lloyd-Jones DM, Bennett G, Coady S, D'Agostino RB, Gibbons R, et al. 2013 ACC/AHA guideline on the assessment of cardiovascular risk: A report of the American College of Cardiology/American Heart Association Task Force on Practice Guidelines. Circulation 2014;129 25 Suppl 2:S49-73. International Atherosclerotic Society Position Paper: Global Recommendations for the Management of Dyslipidemia; 2013. Available from: http://www.Athero.Org/iaspositionpaper.Asp. [Last accessed on 2015 Mar 21]. Lloyd-Jones DM, Leip EP, Larson MG, D'Agostino RB, Beiser A, Wilson PW, et al. Prediction of lifetime risk for cardiovascular disease by risk factor burden at 50 years of age. Circulation 2006;113:791-8. Sacks FM, Pfeffer MA, Moye LA, Rouleau JL, Rutherford JD, Cole TG, et al. The effect of pravastatin on coronary events after myocardial infarction in patients with average cholesterol levels. Cholesterol and Recurrent Events Trial Investigators. N Engl J Med 1996;335:1001-9. Prevention of cardiovascular events and death with pravastatin in patients with coronary heart disease and a broad range of initial cholesterol levels. The Long-Term Intervention with Pravastatin in Ischaemic Disease (LIPID) Study Group. N Engl J Med 1998;339:1349-57. Shepherd J, Blauw GJ, Murphy MB, Bollen EL, Buckley BM, Cobbe SM, et al. Pravastatin in elderly individuals at risk of vascular disease (PROSPER): A randomised controlled trial. Lancet 2002;360:1623-30. Sever PS, Dahlöf B, Poulter NR, Wedel H, Beevers G, Caulfield M, et al. Prevention of coronary and stroke events with atorvastatin in hypertensive patients who have average or lower-than-average cholesterol concentrations, in the Anglo-Scandinavian Cardiac Outcomes Trial - Lipid Lowering Arm (ASCOT-LLA): A multicentre randomised controlled trial. Lancet 2003;361:1149-58. Cannon CP, Braunwald E, McCabe CH, Rader DJ, Rouleau JL, Belder R, et al. Intensive versus moderate lipid lowering with statins after acute coronary syndromes. N Engl J Med 2004;350:1495-504.